The unique looking, bullet-shaped bike in the image above just set a world speed record. 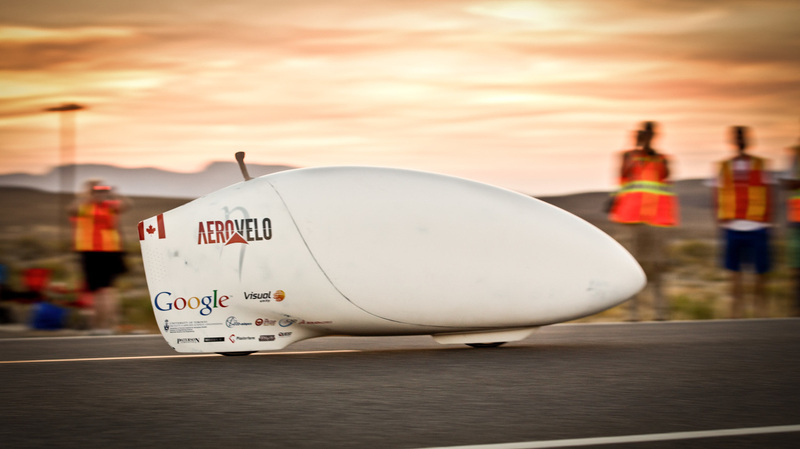 Crazy enough, a human actually fits inside the shell of the Aerovelo Eta, which enabled the bike to set the record for the fastest human-powered vehicle when it hit 89.59 miles per hour. The human who successfully piloted the speedy Aerovelo Eta was none other than one of its co-founders, Todd Reichert, who helped break the record at the World Human Powered Speed Challenge in Battle Mountain, Nevada. As you can see, the Aerovelo Eta requires its driver to be in a rather uncomfortable position, but more importantly it takes an insane of amount of energy to pedal it to its top speed. Luckily, the bike’s low center of gravity, thin tires, bullet-like outer shell, and lightweight frame helped to minimize rolling friction and wind resistance on its way to the world record.